A resource is a kind of material or energy that can be used, depleted, stored or generated by certain parts during missions. Common resources include liquid fuel and oxidizer, both of which are used in liquid engines, and electric charge, which has many different applications. All resources available in a craft can be viewed at any time during a mission using the Resources icon (see at left) at the upper right of the screen. The following table contains all the resources currently implemented. ↑ 1.0 1.1 1.2 Since 0.23.5 the resources will be drained from the first stages first, but is still available without plumbing. Adjacent: Resources will only flow between adjacent sources and sinks, meaning that tanks can be drained unevenly. Everywhere: The resource is always available to all parts structurally connected to the vessel, and the same amount of resources is drained from every container. Internal: The resource can only be used by the part containing it. None: The resource won't be pumped automatically but can be manually transferred. Introduced in 1.0 was a new, non-burnable resource: Ore. This resource is mineable all across the solar system using ISRU parts. Ore can then be brought back to convert into funds and science. Mining can also be used to refine fuel. Not strictly a resource but the liquid fuel/oxidizer mixture for the engines has a density of 5 kg/unit and costs 0.459 /unit. One unit mixture consists of 0.45 units of liquid fuel and 0.55 units of oxidizer. Most resources can be manually transferred from one container to another one, which is usually done by right-clicking two containers while holding the Mod key and then using the in and out buttons under the resource indicators. The transfer is stopped automatically once the source container is empty or the target container is full, but it can also be stopped manually using the stop button under the indicators. Multiple resources can be transferred at the same time, however the containers' right-click menus must stay open, otherwise the transfer will stop as well. Some parts are listed as "Fuel Crossfeed Capable", which means that they allow fuel to move automatically through them to other parts that are attached to them. Fuel crossfeed can be disabled on any capable part via the right-click menu. Note: When in career mode, resource transfer is not possible until the R&D facility is at level 2. Crossfeed however is always possible. Storage can be as important as generation capacity for spacecraft. 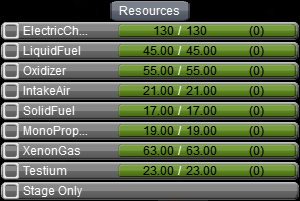 KSP does not connect resource sources to sinks; instead, they contribute or request resources from a common pool. This is much simpler than the realistic approach (as major fraction of a real spacecraft's mass and engineering effort is spent on cables and tubes), but it can lead to unexpected difficulties when a spacecraft is generating and consuming large amounts of resources (e.g. power-intensive spacecraft, or any addon which provide life support, recycling, manufacturing, and similar purposes). Take the example of a spacecraft with a generators generating 1000 units of electric charge (⚡) per second, ion engines which consume 1000 ⚡/s, and batteries which can only store 10 ⚡. Each second, the panels will provide 1000 ⚡ to the spacecraft, and so KSP will fill up the batteries. 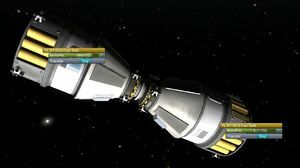 The ion engines will request 1000 ⚡, and KSP will empty the batteries and give them 10 ⚡, limiting them to 1% throttle, and probably leaving them locked in a permanent state of "insufficient power" and maybe even starving the probe core. When dealing with addons that add more resources, the need for "intermediate storage" becomes even more pressing. This page was last edited on 28 March 2016, at 22:40.